I’m starting to have a funny relationship with Mondays. The longer I am out of work the more uneasy I am with Monday — the unofficial beginning of the work week, especially for nine-to-fivers like I was. It means, in concept, that every other person in the world has a place to go on Monday morning, a purpose to fulfill, a job to do, a salary to earn. Every other person, that is, except for me. Being out of work for an extended period of time, the weeks begin to fly by so fast I don’t have a chance to experience all five days. Monday comes around in a snap and before I can blink the uncertainty from my eyes, it’s Wednesday. What happened to Tuesday? But before I have a chance to solve that mystery, I turn around and it’s Friday! What the heck? Did Thursday jump ship? The five-day work week has turned into three days, and if my math is correct, that’s two less days of productivity, two less days of job board checking, two less days before the next Monday. But on the other hand, Monday can be a rejuvenator for me. If the bad news is that it’s Monday again and I have nowhere to go, then the good news is that it’s Monday again and I get a brand new start — a new start to rejoin the life that is going on all around me. Like every birthday that rolls around, every January 1, or each new school year, Mondays mean a do-over, the start of a whole new parade. And it’s a reminder to get moving before it passes by. Before the parade passes by. Suddenly, I’m remembering the inspirational song from the 1969 film Hello Dolly. I start to sing out loud, but the words catch in my throat . . .
Life without life has no reason or rhyme left . . . The lyrics hit a little too close to home, and it makes me want to shake my head to erase the image of hopelessness that tries to creep in and set up its tent. I turn my gaze from the computer screen to the backyard and my potted plants on the deck. I notice my tomato plant is beginning to show signs of wear, signs that the parade of tomatoes is about over. While the plant has nearly fulfilled its narrow purpose here on Earth, I, unfortunately, am still flitting about like a honey bee who can’t find a flower to save its life. I’m struggling to find my way back to a world I once knew, where I was marching in the parade along with everyone else, instead of lost off course somewhere straining to follow the sound of the marching band. On Mondays, I typically begin my energetic and enthusiastic review of job website after job website — all morning long. My goal is a paycheck. My drive? Not so much my desire to rejoin the parade route as the mounting stack of bills beside me. My energy and enthusiasm are soon deflated, though, as I begin to calculate that for every million or so job postings out there on the Information Superhighway, there must be about a gazillion job seekers like me speeding along after them in the fast lane. What’s that old motivational definition of insanity? Doing the same thing and expecting different results? That sounds like me. To calm my rising anxiety level, I switch gears and move into the slow lane to rethink my route. I need to refuel and refocus. My life, my future, my job hunt, my heart and soul need a definite kick-start. And it’s a bit early for tequila shooters. Instead, I grab some just picked tomatoes off the counter. To get my motor running — and my taste buds jumping — I make an early dinner of Grilled Polenta with Spicy Tomato Sauce — my little spike on a basic marinara and pasta dish. Just the sort of thing to shake up a plain ole’ weekday. Maybe it’s wasting valuable time, this knack I have for playing in the kitchen when I should be hitching a ride back to solvency and sanity. But there’s only so much disappointment a girl can take in a day. Besides, there’s another Monday right around the corner. This meatless sauce is fresh, bright, and warming, with its kicky little spark of crushed red pepper flakes blending with the sweetness of sun-ripened tomatoes and onion softened in butter and olive oil. Try it and see if it doesn’t jump start whatever nagging, uphill battle you’re currently fighting — and kick you right back into the parade where you belong. Open polenta and drain liquid from package; slice tube into 3/4-inch-thick slices and blot dry with a paper towel. Lightly brush both sides of each slice with olive oil, and season lightly with salt. Place slices on heated grill or in a heated grill pan — medium heat; cook until grill marks are visible on both sides and slices are firm and crispy to the touch. Remove from heat and place one slice of cheese on each polenta slice; tent with foil so cheese will soften. Meanwhile, melt butter and one tablespoon of olive oil in a large skillet over medium heat. Add diced onion and red bell pepper and cook for a couple of minutes to soften; add garlic; sprinkle with a little salt and red pepper flakes. Cook for another minute, stirring. Gently peel skin from tomatoes and chop; add to the onion mixture and stir; add another light sprinkling of salt and simmer about 10 minutes; add the tomato paste and kalamata olives and allow to simmer until sauce has thickened somewhat, about 10 minutes more. Add the splash of balsamic or red wine and two tablespoons chopped fresh basil and one tablespoon chopped fresh oregano; stir to combine flavors and simmer a couple of minutes. 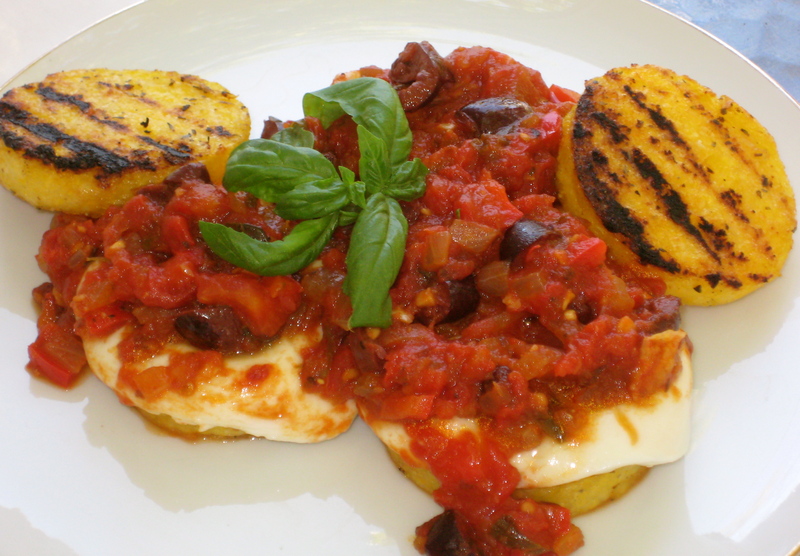 Spoon on top of mozzarella-covered grilled polenta slices. Can be a tasty little appetizer or first course — and it looks darn cute on a small hors d’oeuvres plate. This entry was posted in Cocktails / Appetizers, Comfort Food -- Savory, Entrees, Meatless Meals and tagged grilled, Hello Dolly, kalamata olives, Monday, parade, polenta, sauce, savory, spicy, tomatoes. Bookmark the permalink. Nice writing, very insightful. I like it a lot. I came acoss this website by Yahoo search engine. Keep on the good work.